Movies are free and projected onto an 87 1/2 x 140 ft. screen using an Christie Digital projector. Due to Production Studio guidelines the library may not include movie titles or studio names in its advertising. Please call the library (828-586-2016) for movie titles. Family Movies will be shown every Monday at 1:00 PM throughout the summer. There will be popcorn. are $1.00 and can be checked out for one week (no renewals). April DocuWednesday is More Than Honey, a look at 'colony collapse disorder' affecting bee populations around the world through the lens of beekeeper's in the United States as well as those living in Europe. What does this all mean for the future of our human society? My intention with MORE THAN HONEY was to allow the spectator to understand the drama at play and highlight the pressures of the global economy on these small insects. Their immense, hairy eyes, as well as their unique carapace, make them look like fascinating creatures that have come from another planet – on the big screen, they appear as large as (and often larger than) men. In the struggle between bees and the neo-liberal market economy, bee brokers push beekeepers, who respond by pushing bees, to further increase their performance. Bees have become chain workers, a machine expected to function upon the simple push of a button. In that sense, (and assuming the risk of sounding presumptuous), I could almost say that MORE THAN HONEY is a bit like Chaplin’s 'Modern Times' – as told by bees. The movie showing starts at 4 pm in the Community Room. Free POPCORN is provided, feel free to bring your own non-alcoholic beverage. After the documentary stay to engage in a community discussion about the Documentary and bee's. All programing is co-sposored by the Firends of the Library Bookstore. If you have any questions contact the Ref Desk at 586-2016. If you would like to be added to the DocuWednesday newsletter email Ben Woody at bwoody@fontanalib.org. May DocuWednesday showing will be moved to 6:30 pm with guest presentor, Jane Coburn. June's DocuWednesday movie is about the Equal Rights Amendement. More information to come Free POPCORN is provided. Feel free to bring your own non-alcoholic beverage. Stay after the documentary showing for a lively community discussion. 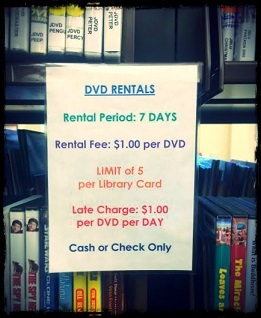 ▸ View all Movies at Jackson County Public Library.